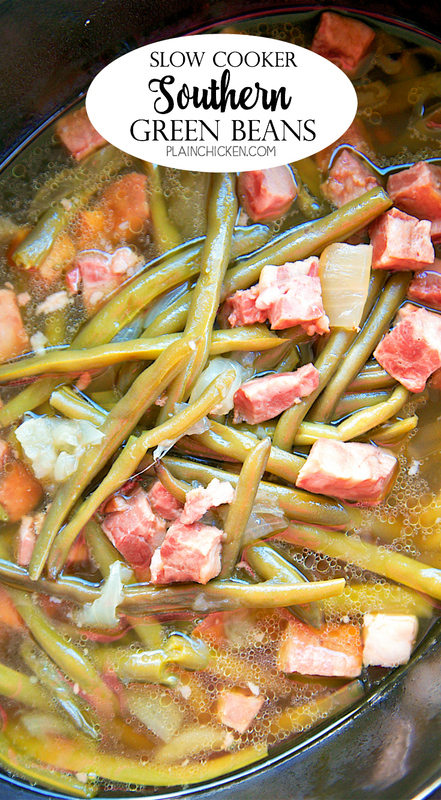 Slow Cooker Southern Green Beans - THE BEST green beans EVER! 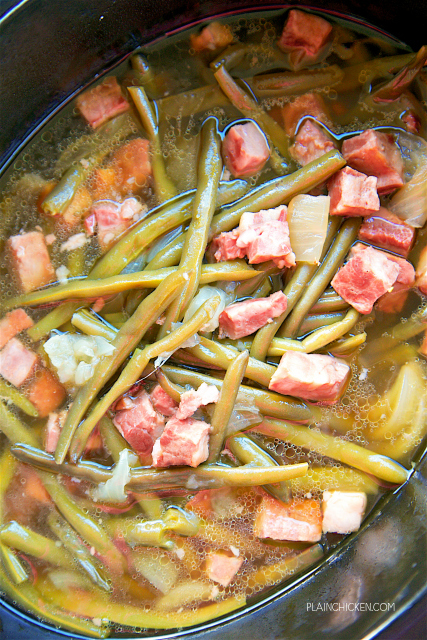 Only 5 ingredients - fresh green beans, ham, onion, cider vinegar, chicken broth. Dump everything in the slow cooker at it does all the work. Great for holiday meals! We make these all the time!! 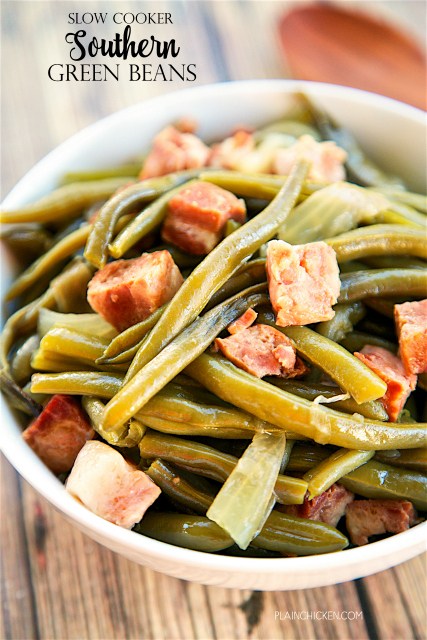 These Slow Cooker Southern Green Beans are THE BEST! They are so good that I could have made a meal out of them. Only 5 simple ingredients and tons of great flavor. My favorite part of this recipe was all the yummy ham! It really put these green beans over the top. I bought the ham in the meat section of the grocery store. There were several varieties to choose from. Any of the diced ham packages will work great. 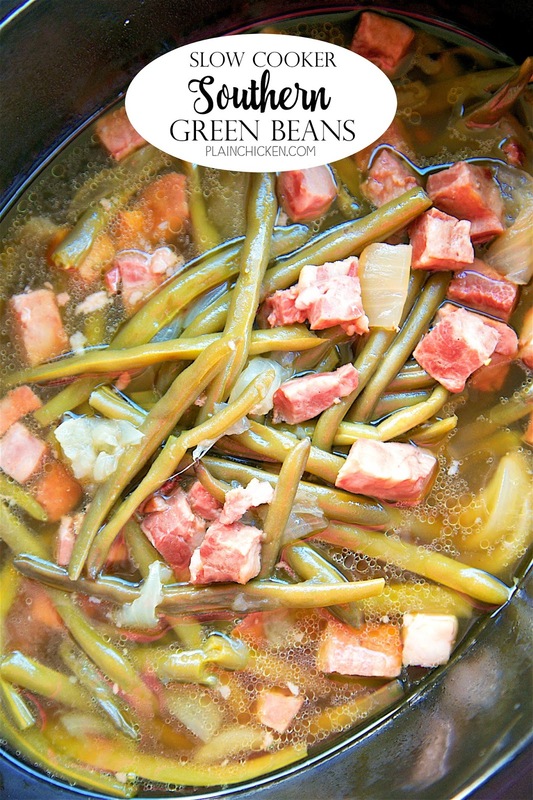 These Slow Cooker Southern Green Beans would be great for your Thanksgiving or Christmas dinner. These green beans are a great alternative to a traditional green bean casserole. They only take a minute to prepare and the slow cooker does all the work! You can't beat hands-off recipes for holiday meals! Combine all ingredients in slow cooker. Cover and cook on HIGH for 4 hours. Looks great. Can't wait to try! Hello I have a question , can you use regular white vinegar? I haven't made it with regular white vinegar, but you can give it a whirl if you prefer. Enjoy!